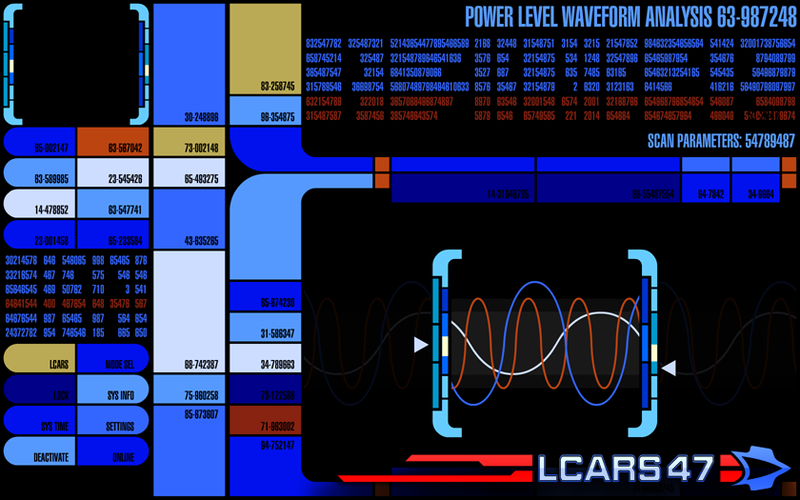 A screen inspired from the Star Trek: Elite Force II game, I've always been a fan of the little tricorder waveform puzzles. It's only an animation, but I thought I'd try to capture the essence of the game. Although I've been pretty strict with regards to canon, I have found games like Star Trek: Voyager: Elite Force and Star Trek: Elite Force II invaluable as they provide a practical 'in universe' method of research for the LCARS 47 project. If you're a fan of the Elite Force series, there are more than a few references to the game, as well as a few secrets and in-jokes for you to find. If you haven't yet played the game, I recommend you do.